Methylcobalamin is a type of Vitamin B12. Vitamin B12 comes in several kinds including hydroxy-, cyano-, and adenosyl-, but only the methyl and adenosyl forms are active within the body. Deficiency occurs from a lack of "intrinsic factor" a mucoprotein enzyme in gastrointestinal tract,from tapeworm infestation or excessive bacteria in stomach and intestines. 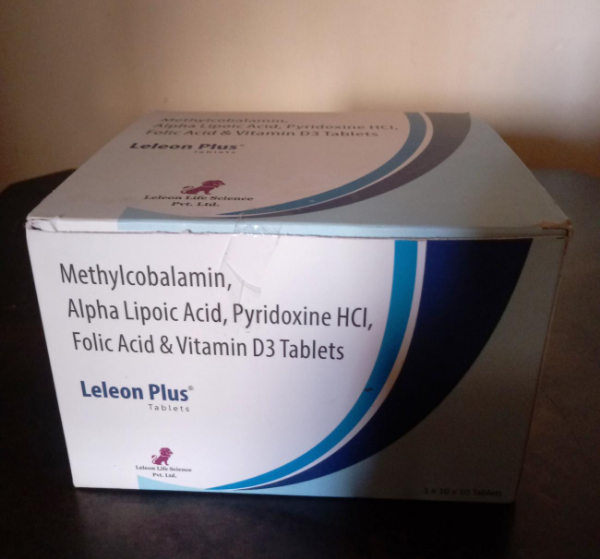 Methylcobalamin donates methyl groups to the myelin sheath that insulates nerve fibres and regenerates damaged neurons. In a B12 deficiency, toxic fatty acids destroy the myelin sheath but high enough doses of B12 can repair it. Folic acid (Vitamin B9), a member of the B-complex vitamins, is a water-soluble vitamin that is unstable in heat and light. Folic acid is required for DNA synthesis and cell growth and is important for red blood cell formation, energy production as well as the forming of amino acids. Folic acid is essential for creating haeme, the iron containing substance in hemoglobin, crucial for oxygen transport. It is important for healthy cell division and replication, since it is acts as a coenzyme for RNA and DNA synthesis. 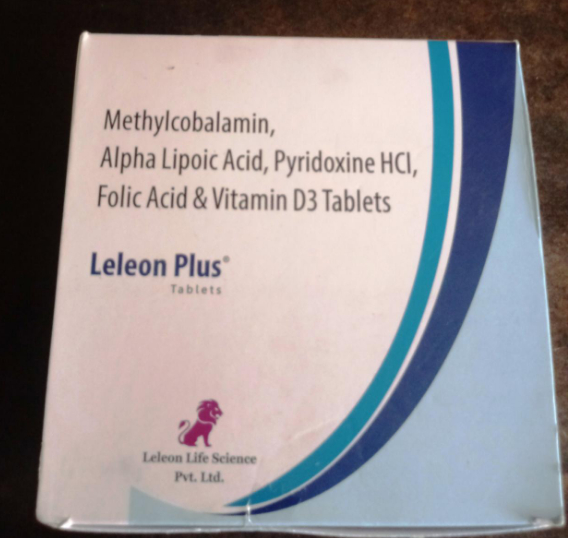 It is also required for protein metabolism and in treating folic acid anemia. Folic acid also assists in digestion, and the nervous system, and works at improving mental as well as emotional health. This nutrient may be effective in treating depression and anxiety. Folic acid is very important in the development of the nervous system of a developing fetus. Vitamin B6 is a water-soluble vitamin that exists in three major chemical forms: pyridoxine, pyridoxal, and pyridoxamine. It performs a wide variety of functions in our body and is essential for our good health. Vitamin B6 is needed for more than 100 enzymes involved in protein metabolism. It is also essential for red blood cell metabolism. The nervous and immune systems need vitamin B6 to function efficiently, and it is also needed for the conversion of tryptophan (an amino acid) to niacin (a vitamin). Alpha Lipoic Acid chemically is 1,2-dithiolane-3-pentanoic acid. It is a sulphur containing substance, which is readily converted from its reduced state, dihydrolipoic acid. It can be found in foods such as meats and spinach. It is readily absorbed in the blood stream and can also cross blood brain barrier. It functions as a cofactor for enzymes involved in conversion of energy from glucose and fats, Krebs cycle (metabolism of fats and carbohydrates). It lowers blood sugar. It is a powerful antioxidant and prevents cellular damage from free radicals thereby reducing oxidative stress. It increases production of glutathione, which helps dissolves toxic substances in liver. Folic acid: Addisonian pernicious anemia, malignant disease. Pyridoxine Hcl: concomitant administration of levodopa. Vitamin D3 is a vitamin. It can be found in small amounts in a few foods, including fatty fish such as herring, mackerel, sardines and tuna. To make vitamin D3 more available, it is added to dairy products, juices, and cereals that are then said to be “fortified with vitamin D3.” But most vitamin D3 – 80% to 90% of what the body gets – is obtained through exposure to sunlight. Vitamin D can also be made in the laboratory as medicine. Vitamin D is used for preventing and treating rickets, a disease that is caused by not having enough vitamin D3 (vitamin D deficiency). Vitamin D3 is also used for treating weak bones (osteoporosis), bone pain (osteomalacia), bone loss in people with a condition called hyperparathyroidism, and an inherited disease (osteogenesis imperfecta) in which the bones are especially brittle and easily broken. It is also used for preventing falls and fractures in people at risk for osteoporosis, and preventing low calcium and bone loss (renal osteodystrophy) in people with kidney failure. Vitamin D3 is used for conditions of the heart and blood vessels, including high blood pressure and high cholesterol. It is also used for diabetes, obesity, muscle weakness, multiple sclerosis, rheumatoid arthritis, chronic obstructive pulmonary disease (COPD), asthma, bronchitis, premenstrual syndrome (PMS), and tooth and gum disease. Some people use vitamin D3 for skin conditions including vitiligo, scleroderma, psoriasis, actinic keratosis, and lupusvulgaris. It is also used for boosting the immune system, preventing autoimmune diseases, and preventing cancer. Vitamin D3 in forms known as calcitriol or calcipotriene is applied directly to the skin for a particular type of psoriasis. Vitamin D3 is required for the regulation of the minerals calcium and phosphorus found in the body. It also plays an important role in maintaining proper bone structure. Nevertheless, vitamin D deficiency is more common than you might expect. People who don’t get enough sun, especially people living in Canada and the northern half of the US, are especially at risk. Vitamin D deficiency also occurs even in sunny climates, possibly because people are staying indoors more, covering up when outside, or using sunscreens consistently these days to reduce skin cancer risk. Older people are also at risk for vitamin D deficiency. They are less likely to spend time in the sun, have fewer “receptors” in their skin that convert sunlight to vitamin D, may not get vitamin D in their diet, may have trouble absorbing vitamin D even if they do get it in their diet, and may have more trouble converting dietary vitamin D to a useful form due to aging kidneys. In fact, the risk for vitamin D deficiency in people over 65 years of age is very high. Low levels of phosphate in the blood due to an inherited disorder called familial hypophosphatemia. Taking vitamin D (calcitriol or dihydrotachysterol) by mouth along with phosphate supplements is effective for treating bone disorders in people with low levels of phosphate in the blood. Low levels of phosphate in the blood due to a disease called Fanconi syndrome. Taking vitamin D (ergocalciferol) by mouth is effective for treating low levels of phosphate in the blood due to a disease called Fanconi syndrome. Low blood calcium levels due to low parathyroid hormone levels. Low levels of parathyroid hormone can cause calcium levels to become too low. Taking vitamin D (dihydrotachysterol, calcitriol, or ergocalciferol) by mouth is effective for increasing calcium blood levels in people with low parathyroid hormone levels. Softening of the bones (osteomalacia).Taking vitamin D (cholecalciferol) is effective for treating softening of the bones. Also, taking vitamin D (calcifediol) is effective for treating softening of the bones due to liver disease. In addition, taking vitamin D (ergocalciferol) is effective for treating softening of the bones caused by medications or poor absorption syndromes. Psoriasis. Applying vitamin D or calcipotriene (a synthetic form of vitamin D) to the skin treats psoriasis in some people. Applying vitamin D to the skin together with cream containing drugs called corticosteroids seems to be more effective for treating psoriasis than using just vitamin D or the corticosteroid creams alone. A bone disorder called renal osteodystrophy, which occurs in people with kidney failure. Taking vitamin D (calcifediol) by mouth manages low calcium levels and prevents bone loss in people with kidney failure. However, vitamin D does not appear to reduce the risk of death or bone pain in people with kidney failure. Rickets. Vitamin D is effective for preventing and treating rickets. A specific form of vitamin D, calcitriol, should be used in people with kidney failure. Vitamin D deficiency. Vitamin D is effective for preventing and treating vitamin D deficiency. Bone loss in people taking drugs called corticosteroids. Taking vitamin D (calcifediol, cholecalciferol, calcitriol, or alfacalcidol) by mouth prevents bone loss in people taking drugs called corticosteroids. Taking vitamin D alone or with calcium seems to improve bone density in people with existing bone loss caused by using corticosteroids. Preventing falls in older people.Researchers have observed that people who do not have enough vitamin D tend to fall more often than people who do. Taking a vitamin D supplement seems to reduce the risk of falling by up to 22%. Higher doses of vitamin D are more effective than lower doses. One study found that taking 800 IU of vitamin D reduced the risk of falling, but lower doses did not. Also, vitamin D, in combination with calcium, but not calcium alone, may prevent falls by decreasing body sway and blood pressure. Taking vitamin D plus calcium seems to prevent falls more significantly in women than men and in older people living in hospitals or residential care facilities than those living in community dwellings. Osteoporosis (weak bones). Taking a specific form of vitamin D called cholecalciferol (vitamin D3) along with calcium seems to help prevent bone loss and bone breaks. Bone loss caused by having too much parathyroid hormone (hyperparathyroidism). Taking vitamin D (cholecalciferol) by mouth seems to reduce parathyroid hormone levels and bone loss in women with a condition called hyperparathyroidism. Multiple sclerosis (MS). Research shows that taking vitamin D can reduce the risk of developing MS in women by up to 40%. Taking at least 400 IU daily, the amount typically found in a multivitamin supplement, seems to work the best. Respiratory infections. Research in school aged children shows that taking a vitamin D supplement during winter might reduce the chance of developing seasonal flu. Other research suggests that taking a vitamin D supplement might reduce the chance of an asthma attack triggered by a cold or other respiratory infection. Some additional research suggests that children with low levels of vitamin D have a higher chance of developing a respiratory infection such as the common cold or flu. However, most research suggests that vitamin D might only have an effect on respiratory infections in children. It does not appear to provide the same benefits in adults. Rheumatoid arthritis. Research suggests that older women who consume more vitamin D from foods or supplements tend to have a lower risk of developing rheumatoid arthritis. Tooth loss. Taking calcium and vitamin D by mouth appears to prevent tooth loss in elderly people. Weight loss. Research shows that people with lower vitamin D levels are more likely to be obese than those with higher levels. Women taking calcium plus vitamin D are more likely to lose weight and maintain their weight. However, this benefit is mainly in women who did not consume enough calcium before they started taking supplements. Mental function. Early research shows that people with higher blood levels of vitamin D have improved mental function compared with people who have lower levels. However, it's not known if taking vitamin D improves mental function. Dementia.Early research suggests that people with dementia have lower blood levels of vitamin D than people without dementia. However, it's not known if taking vitamin D benefits people with dementia. Diabetes. Early research shows that people with lower vitamin D levels may be more likely to develop type 2 diabetes compared to people with higher vitamin D levels. However, there is no reliable evidence that taking vitamin D supplements can treat or prevent type 2 diabetes. Early research suggests that giving vitamin D supplements to infants daily during the first year of life is linked to a lower risk of developing type 1 diabetes later in life. Muscle strength. Taking vitamin D by mouth does not appear to improve muscle strength in people with sufficient blood levels of vitamin D. However, taking vitamin D by mouth, alone or in combination with calcium, may improve hip and leg muscle strength in people who have low levels of vitamin D, especially the elderly. Single injections of vitamin D do not seem to have beneficial effects. Vitamin D is LIKELY SAFE when taken by mouth or given as a shot into the muscle in recommended amounts. Most people do not commonly experience side effects with vitamin D, unless too much is taken. Some side effects of taking too much vitamin D include weakness, fatigue, sleepiness, headache, loss of appetite, dry mouth, metallic taste, nausea, vomiting, and others. Taking vitamin D for long periods of time in doses higher than 4000 units daily is POSSIBLY UNSAFE and may cause excessively high levels of calcium in the blood. However, much higher doses are often needed for the short-term treatment of vitamin D deficiency. This type of treatment should be done under the supervision of a healthcare provider. Pregnancy and breast-feeding: Vitamin D is LIKELY SAFEduring pregnancy and breast-feeding when used in daily amounts below 4000 units. Do not use higher doses. Vitamin D is POSSIBLY UNSAFE when used in higher amounts during pregnancy or while breast-feeding. Using higher doses might cause serious harm to the infant. Kidney disease: Vitamin D may increase calcium levels and increase the risk of “hardening of the arteries” in people with serious kidney disease. This must be balanced with the need to prevent renal osteodystrophy, a bone disease that occurs when the kidneys fail to maintain the proper levels of calcium and phosphorus in the blood. Calcium levels should be monitored carefully in people with kidney disease. High levels of calcium in the blood: Taking vitamin D could make this condition worse. “Hardening of the arteries” (atherosclerosis): Taking vitamin D could make this condition worse, especially in people with kidney disease. Sarcoidosis: Vitamin D may increase calcium levels in people with sarcoidosis. This could lead to kidney stones and other problems. Use vitamin D cautiously. Histoplasmosis: Vitamin D may increase calcium levels in people with histoplasmosis. This could lead to kidney stones and other problems. Use vitamin D cautiously. Over-active parathyroid gland (hyperparathyroidism): Vitamin D may increase calcium levels in people with hyperparathyroidism. Use vitamin D cautiously. Lymphoma: Vitamin D may increase calcium levels in people with lymphoma. This could lead to kidney stones and other problems. Use vitamin D cautiously. Tuberculosis: Vitamin D might increase calcium levels in people with tuberculosis. This might result in complications such as kidney stones.